Place one hand in an easy grip loop and wrap around your back, then place the other hand in the desired Easy grip loop. Kneel down and adjust the CLX flat across your upper back in line with your scapulae. Place hands on ground to assume the plank position. Slowly lower your torso until elbows are bent just above 90°. Tip: For an advanced movement add a second CLX of lesser resistance in front of your body. 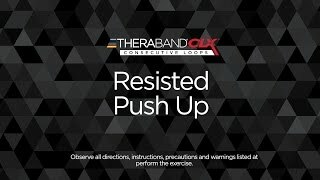 Perform resisted push up and roll into a side plank and perform a resisted full arm extension.